Many people love the look and durability of hardwood flooring. There’s something elegant and powerful about a good, solid maple floor. But traditional hardwood floors aren’t very unique in their style, not to mention the trees that are cut down and processed in order to supply enough wood for the job. Luckily, there’s an alternative: bamboo. Bamboo has the same look, feel and durability of hardwood, but is much more eco-friendly. Bamboo is actually a grass, not a wood. As a grass, it takes bamboo far less time to grow to maturity than a tree. Bamboo can be safely harvested in large quantities without affecting the ecosystem. 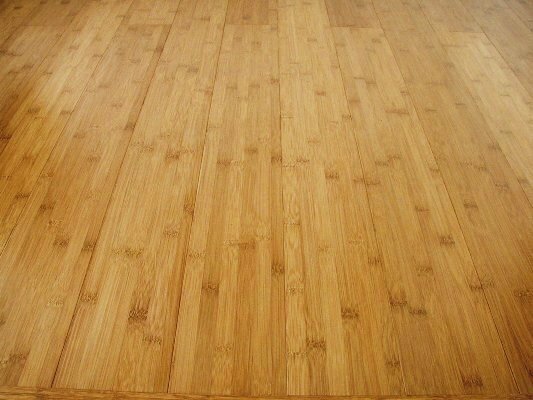 In order to turn adult bamboo into flooring, it must be processed. First the bamboo canes are cut into strips and boiled in a special solution to soften them and preserve them. Next, the bamboo strips are pressed into flat planks while a urea-based resin is used to turn them into well-laminated boards. The result of this process is flooring that’s lighter than oak, hard as maple, and just as dense and shrink-proof as the best traditional hardwood flooring. Best of all, it doesn’t harm the environment in the slightest, it growing over ten times faster than trees. 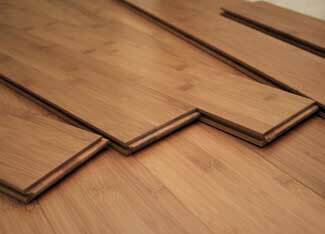 Bamboo flooring typically costs between $3 and $8 per square foot (prices in USD). This will vary on the quality of the flooring and the length and width of the planks, as well as whether it’s finished or unfinished. Finished bamboo flooring has a slightly rounded edge which gives it more of a planked look. The finish used is polyurethane, so you can be sure that it won’t stain. Unfinished bamboo tends to have square edges which allow them to fit together better. You can then finish them with a sealant after they’re laid down to ensure their durability. There are a few things to keep in mind when purchasing bamboo flooring. First, it’s best if you can buy all of your flooring at once from the same merchant. The reason for this is because the shade of the bamboo will vary depending on growing season, weather, the amount of water they were given, etc. If you purchase it in bits and pieces, you’re liable to wind up with a patchwork floor that won’t look very appealing. Another thing you should ask your flooring retailer about is the age of the bamboo. Typically, you want the bamboo to be at least six years old; any younger and it won’t have the same woody texture. Before you install the flooring, you should take it out of its packaging and let it sit in your house to acclimate itself to the humidity. Typically, this only takes about 1 week; you may wish to leave it for up to 2 weeks to be absolutely sure it has the same moisture content of your sub-flooring. Bamboo is much more resistant to moisture than regular hardwood flooring, so it’s a great option for kitchens. Once this is done, you’re ready to install your durable, eco-friendly bamboo flooring. You can expect to enjoy it with minimal maintenance for years to come.